Faces Cosmetics has always been my favorite brand ever since I was introduced to it. There is not a single product that disappointed me till date! Recently Faces Cosmetics launched DIY nail kits consisting of 3 nail polishes that allows you to create your nail designs at your home! They have come up with 2 collections- Cocktail Collection and Love Struck Collection! I have "Cocktail Collection" that includes black, red and gold glitter. It is perfect to dress up your nails for a party in an easy manner! The DIY nail kit is priced at Rs 399 and you can BUY ONLINE HERE. I absolutely loved the golden top coat! Faces Cosmetics DIY Nail Kit* consists of 3 nail polishes- Scarlet, Cast A Spell and Starry Night! 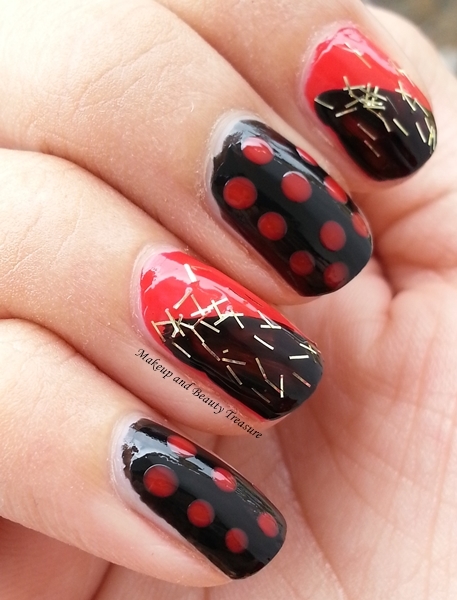 Red, black and gold combination is a sign of glamorous and this DIY nail kit is a perfect kit if you want to your nails to look chic and glamorous. You can go creative with this nail kit and create your own designs. 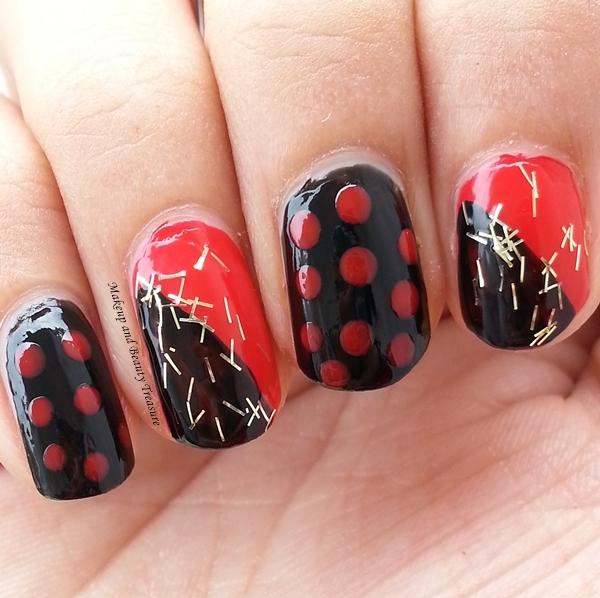 My to-go-to designs are polka dots and slanting nail art that I can do in few minutes! I have now become an expert in these two designs. The coral red and black nail polishes have good formula and apply easily without streaks. They give full coverage in a single coat but you can always go for the second coat. Starry Night ie the gold fleck top coat is the showstopper in this kit and instantly glam up your nails. This top coat keeps my nails fresh and chip free for a good 4-5 days! - Cocktail Collection has the perfect combination of colors! - Good coverage nail polishes. - A kit for perfect party nails! - I loved the glamorous packaging! - Do not stain the nails! Faces Cosmetics DIY Nail Kit in Cocktail Collection has been my favorite nail kit since the time I am using it. I loved how it makes my nails look bright and attractive. You can go for any nail design you like. The kit is pocket friendly and I would highly recommend it to everyone! - Let the nail polish dry before applying another nail polish! - Starry Night acts as a top coat so you do not need a separate top coat for the same! - Though this kit does not stain nails but it is advisable to use a base coat to be on the safe side! - Store the kit in a cool, dry place! 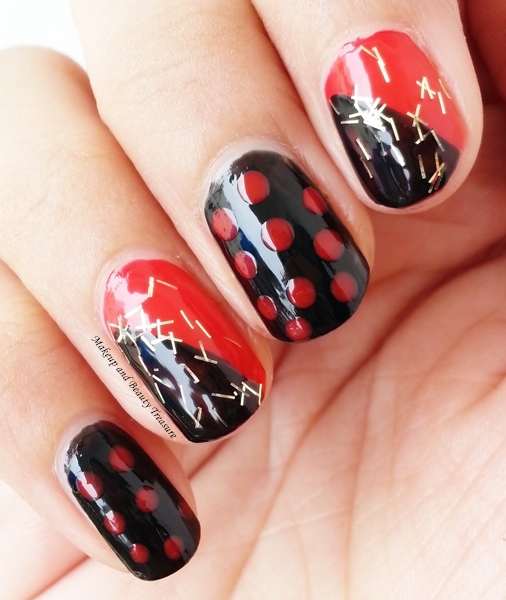 - You can use Starry Night separately on red and black nails! What do you think of Faces Cosmetics DIY Nail Kit? Would you try it? Loved ur NOTD.. this kit is perfect fr gifting as well..
Its a perfect combo for me! Would love to have this in my collection.